Sony has started to slowly roll out promotion for the upcoming Venom movie with the first image of Tom Hardy as Eddie Brock released along with the full video from last year's panel at Brazil Comic-Con. We've seen unofficial set videos and pictures, but this is the first official look that we have seen. Hardy has released photos on his Instagram from the set, but they've been limited to pictures hanging in the actor's trailer along with training video. The release date for Venom is less than a year away now, so more images and promotional material is expected to drop soon. IGN teased at the beginning of the week that they were going to share some exclusive Venom news, which they unveiled today. The aforementioned first official image of Tom Hardy as Eddie Brock features the actor holding a notebook, which upon further investigation, mentions the Life Foundation, which will serve as a large portion of the movie. It has recently been revealed that Riz Ahmed is portraying Dr. Carlton Drake, the head of the Life Foundation, a group that is trying to replicate Eddie Brock/Venom's superpowers. Elsewhere, it appears that Michelle Williams will be playing Brock's ex-wife Anne Weying as has been speculated. However, the actress has hinted that she will not be suiting up as She-Venom in the upcoming movie. In addition to the first official image of Tom Hardy as Eddie Brock, IGN also released the official Venom panel from Brazil Comic-Con, which took place late last year. In the video, director Ruben Fleischer starts the video from the San Francisco set in Atlanta, Georgia. Contrary to previous reports, it was actually Fleischer who announced that the source material for Venom was taken from the Lethal Protector comic series, not Tom Hardy. The crowd erupted at that piece of news, but they went insane when Hardy casually walked behind Ruben Fleischer. Tom Hardy took front and center in the video, which was live broadcasting from the set, and premiered the first piece of Venom promotional material, which was an exclusive Brazil Comic-Con t-shirt with Venom's face over the red "v" logo that has since been released worldwide. 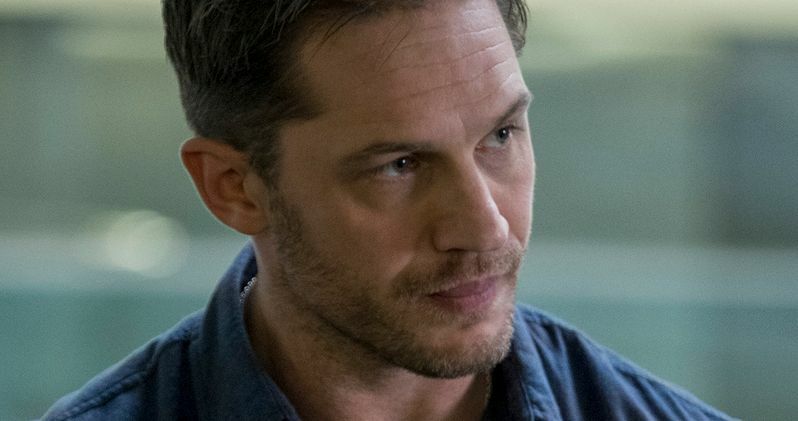 More importantly, Hardy addressed the fans, saying that he will do the best job that he possibly can to bring Venom and Eddie Brock to the big screen and do the character justice. One thing that is clearly evident from the Brazil Comic-Con video is the excitement of Ruben Fleischer and Tom Hardy. They were clearly ecstatic to finally be able to bring some news from the closed set. Fleischer admitted that they had been working on an entirely closed set with zero visitors since the production began. While we still have some waiting to do, you can check out the first image of Tom Hardy as Eddie Brock along with the official video footage from the Venom panel at Brazil Comic-Con below, courtesy of IGN.